This recipe is not gluten free. I contribute a variety of recipes to several non gluten free clients. I made Tortellini and Sausage Soup for Capital Style Magazine a few months ago. I know that I normally share gluten free recipes but this was a family favorite and I want my family to have it for their virtual cookbooks. I am trying and testing gluten free pasta doughs all the time. I have yet to find one that I like or that I can consistently make without a failed attempt. It has been frustrating for me. When I need a gluten free filled pasta I shop at Whole Foods and buy the brand they have in their cheese section. STOP THE PRESSES AND IGNORE THAT LAST PARAGRAPH ABOUT NOT HAVING A GLUTEN FREE PASTA FOR STUFFING--I DO NOW! Update: I wrote this last week and I have fretted over the fact that I cannot provide my gluten free readers with a reliable gluten free pasta dough that I have successfully made. These things do keep me up at night. I have tried a variety of recipes but nothing quite tasted or felt right. I woke up yesterday with an epiphany of what I was doing wrong. I was close but always missed the mark on the dough ever so slightly. Today--nailed it! I have successfully made stuffed gluten free pasta in the shapes of tortellini and ravioli. So what is next? I need to make it 3 more times this weekend to be 100% sure that it will work. Please come back next week and I will be posting the recipe for the gluten free pasta dough. So with that said, here is a recipe that I use for pasta. It works well in my pasta machine and my family likes the flavor. First, don't be afraid to make pasta from scratch. It may seem overwhelming your first time but it gets easier the more you do it. Pretty soon you will be making it without a recipe. It takes a bit of planning but it is worth the time and effort. Second, making stuffed pasta is equally as enjoyable but it does take a bit more time and planning. Again, once you make it a few times it will get easier and easier. Stuffed pasta is fun because you can make a variety of fillings. The filling recipe I am sharing is a basic cheese filling that my family, especially the kids, enjoy. I own a ravioli tray--LOVE IT! That is an option if you don't want to make the tortellini. 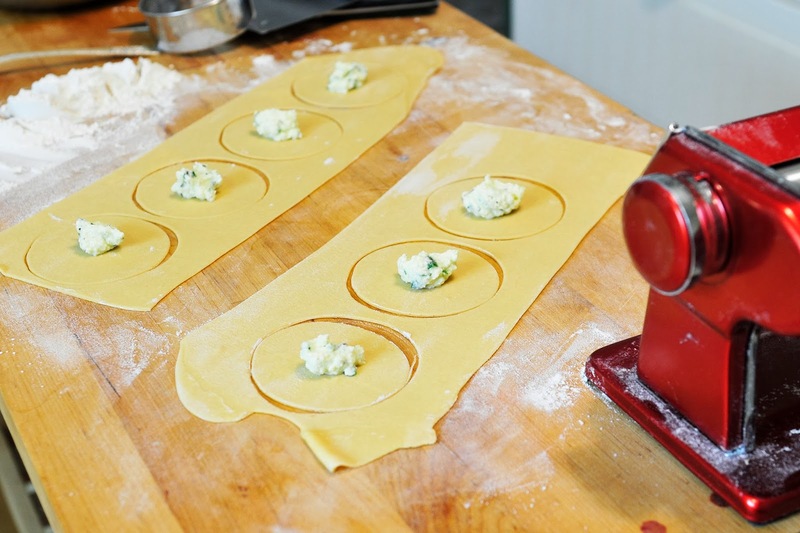 These tortellinis are made using your two hands. Be patient with your abilities the first few you make. It took me about 5 before they looked like the picture at the top of this post. My daughter helped me make a bunch too. Kids love to make pasta! When I make pasta, it is standing room only. What I mean by this is that my family is standing in the kitchen with bowl in hand waiting for me to take the pasta out of the boiling water. They go and sit and eat. Then they start the process over. I work on an island in the middle of my very small kitchen and whip these puppies out as fast as possible. I am standing too! I know this looks like an overwhelming night in the kitchen and it might be your first time. I would just encourage you to give it a try once. Let me know how they turned out for you and your family. 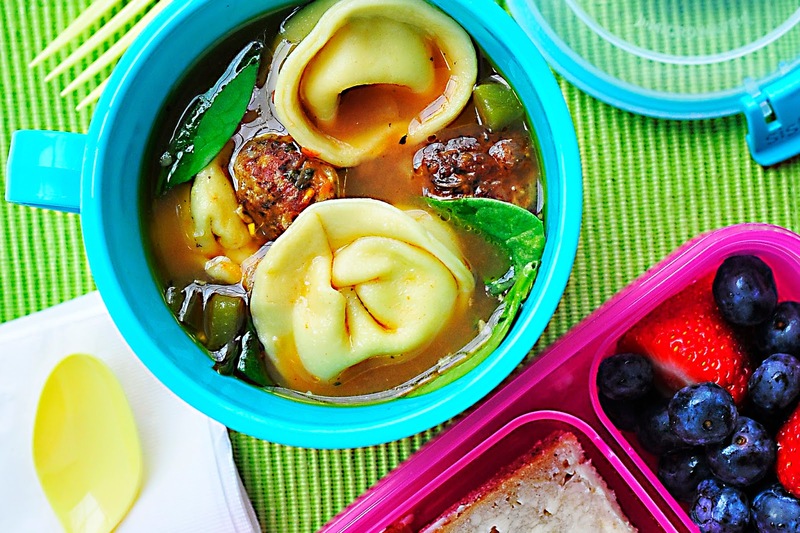 I used some of the tortellini in this Tortellini and Sausage soup. Recipe coming tomorrow to the blog. 1 batch of pasta is enough to feed my family of 5. It will make about 50 tortellini's depending on how large of a circle cutter you use. 1. Mix the salt and flour together and dump on a clean table. Make a well in the center of the flour and add your eggs and 3T. water. With a fork, start mixing the eggs into the flour. I also like to have a metal pastry scrapper so that with one hand I am mixing and the other one I am keeping my flour from going all over the place. Work the dough into a ball. I keep a bowl of water nearby. As I start to knead the dough and if it feels too dry I wet my hands and go back to kneading. I might do this 3 or 4 times. The dough should not be dry. 2. Kneading time will be about 10 minutes. Around 8 minutes into the kneading you will notice the dough start to become softer. 3. 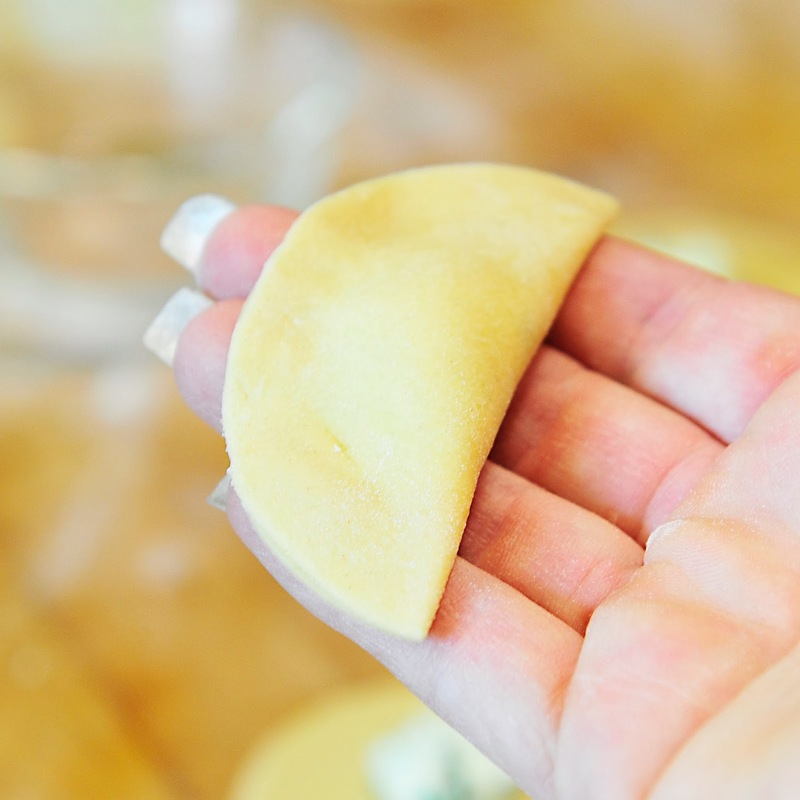 After you have kneaded the dough, cut the ball into 4 sections. I wrap each section in saran wrap and let it rest for 30 minutes. NOTE: The instructions above are for mixing the dough by hand. I don't do this every time because I don't always have, well, the time. I do make this in my Kitchen Aid too. I add all of the ingredients to the bowl. Add the dough hook. Slowly start the mixer until everything is combined and formed into a ball. If the dough is too dry, add a teaspoon of water. If the dough is not shaping into a ball, add a dusting of flour until it has pulled away form the bowl. Once the dough is in a ball and pulled away from the bowl, knead for 5 minutes at a medium speed. Once dough is kneaded, follow step 3 above. 1. Mix the filling ingredients together in a small bowl. 2. Keep in refrigerator until ready to use. 1. Prepare your pasta and filling. (Instructions above) Bring a large pot of water to a rolling boil. 2. Roll out your dough into long pasta sheets. Do this by hand rolling with a rolling pin or using a pasta machine. If you need help with how to use your pasta machine--go here for more detail. 3. I use a 3 inch round cookie cutter to make the circles. Add a 1/2 teaspoon or less of filling to the center of each circle. See picture below. You can do more but I find they are harder to close with a very full center. 4. To shape the tortellini. I lift each circle, dip my finger in a bowl of water and run it around the edge of the circle. Fold the circle in half. Lightly pinching the dough together . See picture below. I flip the pasta so that the straight edge is next to the tip of my fingers. Using both hands, and with my thumb and pointing finger, I grab the edges and have them meet together. I overlap the corners and push together to seal. Add a touch of water if they are not staying. When you bring the two edges together the rounded part of the halved shape will start to curl up. See pictures. 5. Add filled tortellini to soups or boiling water to cook. They take about 5-6 minutes to cook through. The size does matter so if they are bigger they may take longer to cook. 6. Remove tortellini from boiling water and serve with your favorite sauce, browned butter or grated parmesan cheese. 7. 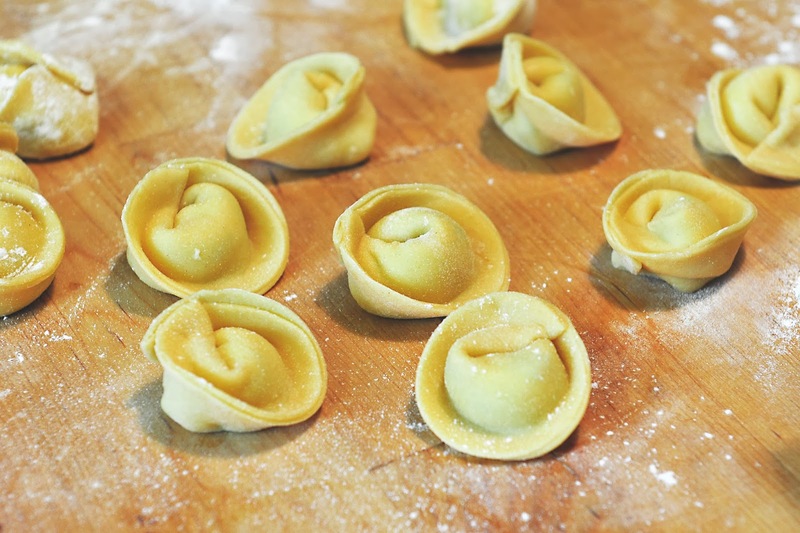 Leftover cooked tortellini can be kept in the refrigerator and reheated the next day. Leftover dough can also be refrigerated but not for more than 2 days. 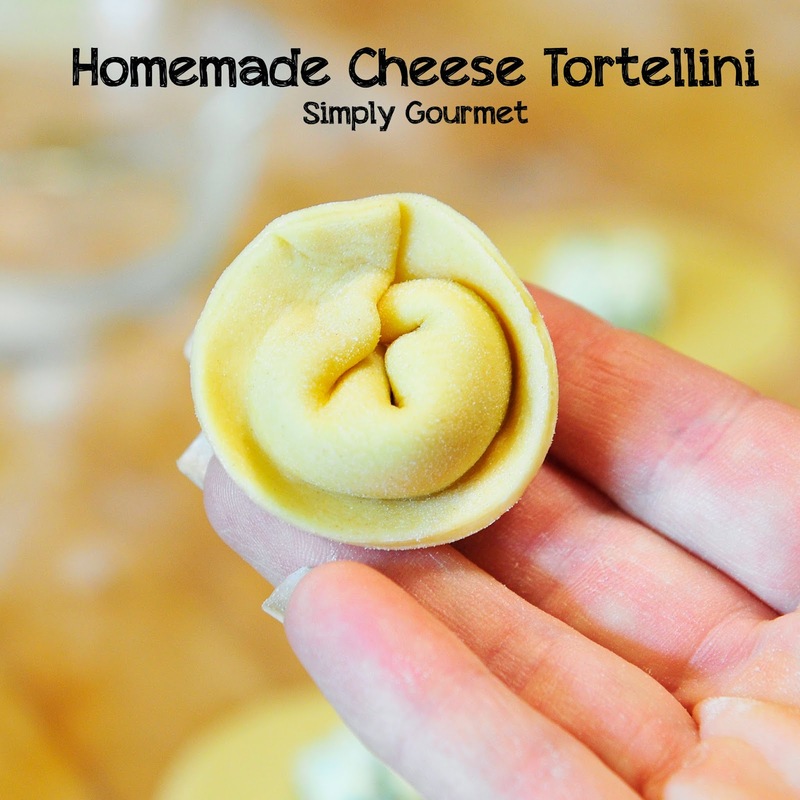 I love to make homemade pasta, but have never tried tortellini. Your's sounds fantastic! I also love your tip about making the pasta in the Kitchen Aid. I've never tried that but I'm going to have to, it sounds like a great time saver! Thanks Lisa! I used to be a stickler about doing the pasta mixing by hand, but then life took over and I had to find a shorter way of doing it. The kitchen aid methods works really well for me. Let me know how it worked for you and make some tortellini. You will love them!